Please email me if you would like to include your family on this website. BORDEN, GAIL, JR. (1801-1874). Gail Borden, Jr., inventor, publisher, surveyor, and founder of the Borden Company, son of Gail and Philadelphia (Wheeler) Borden, was born in Norwich, New York, on November 9, 1801. In 1816 the family moved to New London, Indiana, where Borden obtained his only formal schooling, totaling not more than a year and a half. He is thought to have been captain of the local militia when barely twenty years old. In 1822 he was a principal figure in rescuing a freedman from rustlers. Shortly afterward he moved to Mississippi in search of a milder climate to cure a persistent cough. In Mississippi Borden surveyed and taught school. In 1826 he was official surveyor for Amite County as well as deputy federal surveyor. After arriving at Galveston Island on December 24, 1829, he farmed and raised stock in upper Fort Bend County and spent some time in surveying. By February 1830 he had succeeded his brother, Thomas H. Borden, as surveyor for Stephen F. Austin's colony. In 1832 Borden was named one of three members of the San Felipe committee of correspondence. In the Convention of 1833 he represented Lavaca District . He also assumed many of the duties of colonial secretary for Austin in the absence of Samuel M. Williams. As early as January 1835 Borden made plans to found a newspaper, but it was October 10 before the first issue of his Telegraph and Texas Register, published in partnership with his brother Thomas and Joseph Baker, appeared in San Felipe. 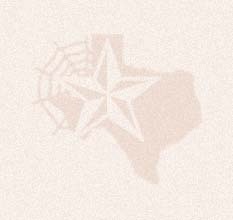 In the meantime he had prepared the first topographical map of Texas and had resumed his responsibilities on the committee of correspondence. Borden published the Telegraph in San Felipe until March 1836, in Harrisburg in April 1836, in Columbia from August 1836 to April 1837, and in Houston in May and June 1837. In October 1835 he was appointed collector for the Department of Brazos, a post he held until 1837. In October and November 1836 he helped lay out the site of Houston. On June 20, 1837, Borden sold his partnership in the Telegraph to Jacob W. Cruger and became the first collector of the port of Galveston under the Republic of Texas. His first term as collector lasted from June 1837 to December 1838, when Mirabeau B. Lamar removed him for political reasons. His second term lasted from December 1841 to April 1843; he resigned after a dispute with President Sam Houston over evaluation of exchequers. From 1839 to 1851 Borden was secretary and agent for the Galveston City Company, which owned most of Galveston Island and for which he helped sell 2,500 lots. He invented a "locomotive bath house" for Galveston women who wished to bathe in the Gulf of Mexico. As an alderman he helped to rid the island temporarily of gamblers. He and his first wife reputedly became the first Anglo-Americans to be baptized in the Gulf west of the Mississippi River. He became Sunday school missionary to the poor and to travelers. He was a trustee of the Texas Baptist Education Society, which founded Baylor University. And he was an officer in the local temperance society and deacon and clerk of the local Baptist church. In 1842 Borden directed insular defenses against an expected Mexican invasion. In the middle 1840s he began inventing. He is supposed to have experimented with large-scale refrigeration as a means of preventing yellow fever and with a terraqueous machine, a sort of prairie schooner that would go on land or water. In 1849 he perfected a meat biscuit, made of dehydrated meat compounded with flour, which he tried to market on a worldwide scale in partnership with Ashbel Smith. Although this project left him deeply in debt, for seven years Borden struggled to sell meat biscuits. For this purpose he moved to New York in 1851 to be nearer trade centers. In 1853 he sought a patent on a process for condensing milk in vacuum, but it was 1856 before he received American and British patents. He then dropped the meat biscuit to devote himself to condensing milk. He opened a factory in Connecticut in 1856 but failed, then tried and failed again in 1857. Through Jeremiah Milbank, a New York financier, he received new backing and opened another factory in Connecticut in 1858. When the Civil War brought intensified demand for condensed milk, sales grew so much that Borden's success was assured. He opened another factory in Connecticut, two in New York, and one in Illinois and licensed other concerns in Pennsylvania and Maine. He also invented processes for condensing various fruit juices, for extract of beef, and for coffee. After the Civil War he established a meat-packing plant at Borden, Texas, twelve miles west of Columbus, and a sawmill and copperware factory at Bastrop. After 1871 he spent his winters in Texas because of the milder climate. In 1873 he built a freedmen's school and a white children's school, organized a day school and a Sunday school for black children, aided in constructing five churches, maintained two missionaries, and partially supported numerous poorly paid teachers, ministers, and students. Borden married Penelope Mercer in Mississippi in 1828; they had seven children. In 1845 he married Augusta Stearns, and in 1860 he married Emeline Eunice Church. He died in Borden, Texas, on January 11, 1874; his body was shipped by private car to New York to be buried in Woodlawn Cemetery. Story behind this photo is that it was taken in a Saloon in Gail (about 1901). Adam Clark Mitchell was an ordained Methodist Minister (as were his father and grandfather), so it was surprising that he would be in a saloon. However, it was reported by people who knew Adam Clark (called Clark or Uncle Dock) that he enjoyed fine whiskey and had it shipped in by rail, meeting the train himself. 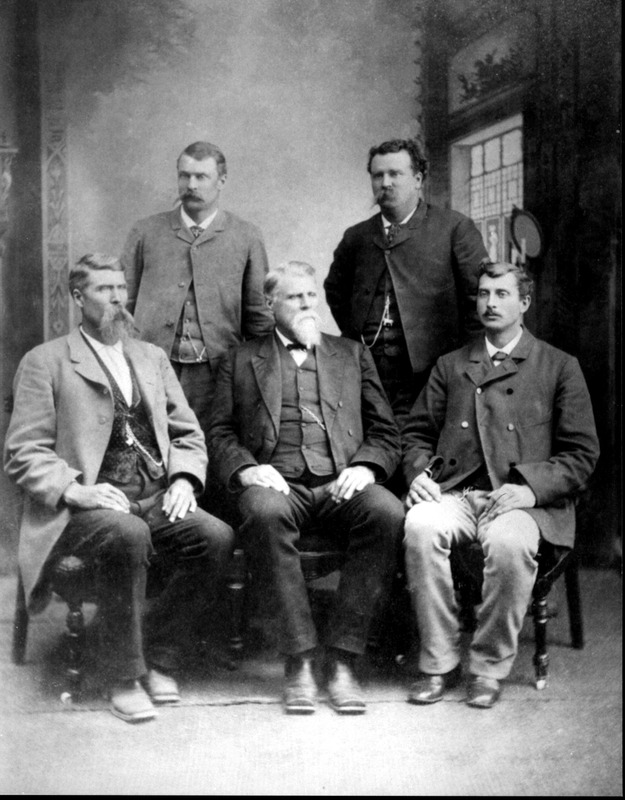 These Mitchell men were also cattlemen and ranchers. Note the chains with "bulls" on them. James Darling MITCHELL was born in Cedar Co., Missouri May 7, 1851. James died September 1, 1902 in Gail, Borden Co., Texas, at 51 years of age. James Darling Mitchell never married. About ten minutes after he had eaten (some watermelon) J. D. began to complain. He grew sick at the stomach but after vomiting he felt better......... His relief, however, was only momentary and he soon began to get worse. Frank Smoot was dispatched to Gail for medical aid....... but the spirit had departed long before the physician (Dr. Prince) arrived on the scene. The physician pronounced the cause of death as heart failure. .....He and his brother, J. K. Mitchell, came into possession of a small ranch of their own, near Gail, where with much care and patient industry they have succeeded in grading up their cattle till now they have one of the finest heads of pure bred Hereford and Durham cattle in West Texas. The Citizen joins his many other friends in mourning his loss... The remains will be interred in the Gail Cemetery this evening." Adam Clark MITCHELL, son of Rev. James MITCHELL and Sarah (Sallie) NAVE, was born in Blount Co., Tennessee June 5, 1824. Adam died March 25, 1905 in Borden Co., Texas, at 80 years of age. Death recorded in Texas File #8585 as March 26, 1909.. He married twice. He married Mahala SMITH in Polk Co., Missouri, September 5, 1844. Mahala was born in St. Charles Co., Missouri August 16, 1826. Mahala was the daughter of Darling SMITH and Winny CLAY. Mahala died August 27, 1876 in Polk Co., Missouri, at 50 years of age. Mahala Smith is buried at Mitchell Campground, Polk Co., Missouri. Plot # 226. Mitchell Campground and Cemetery is located in Wishart Township, about 2- 1/2 miles N/E of Wishart. He married Mrs. Mary E. Bennett in Shreveport, Caddo Co., Louisiana, March 23, 1878. Mary was born in St. Clair Co., Illinois February 16, 1842. Mary died November 17, 1897 in Shreveport, Louisiana, at 55 years of age. An Obituary (in the possession of Winston Ewing) taken from the "Shreveport Louisiana Progress" records that Mary Ellen was born February 16, 1842 in St. Clair Co., Illinois, and that she married her first husband, W. E. Bennett, in New York. W. E. died in Shreveport in 1870." Mary Ellen was apparently 18 years younger than Adam Clark Mitchell and was only 55 years old when she died, but she and A. C. had been married almost 20 years. "Adam Clark Mitchell ranks among the most colorful personalities in the Mitchell Clan. Born June 5, 1824, in Blount County, Tennessee, he came with his father, Rev. James Mitchell, to Missouri in 1834. On September 5, 1844, he became the husband of Mahala Smith. Together they begot eight children. But marital ties and parental responsibilities did not hinder this "globetrotter". This enterprising man bought a Cedar County farm where he both farmed and traded in calves. During 1846, he and three others bought three hundred fat hogs which they drove southward seeking sales. They continued through the Cherokee, Chickasaw and Choctaw nations and swam the Red River on January 5, 1847. In Bowie County, Texas, the hogs were sold to some planters. Adam Clark was down with the mumps for two weeks. Upon arriving home, the hog dealers divided $404.00 between them. The Adam Clark Mitchell family later moved into Polk County, Missouri. In 1851, A. C. planned a cattle drive to California with W. C. Campbell and William Smith (Mahala's brother). On the fourth of April, 1852, these men with 1000 head of cattle, sixty persons including families, and some young men in search of gold, left Bear Creek, near Fair Play, for the Golden West. A. C. had $3,000.00 invested in wagons, teams, and stock. The crossing of the Platte River, near Kearney, Nebraska, posed for them a perilous task. The river was a mile wide with a bed of quicksand. Tragedy could engulf the enterprise should they make a miscue in attempting this crossing. A careful plan was devised to assure a safe passage. Six or eight oxen were hitched to a wagon. Four mounted drivers were assigned to each side of the teams. Two other sharp-eyed men, one on either side of the teams, were to look for hidden holes. When a wagon began to roll, the mounted riders were to whoop and whip the oxen to assure continuous progress. Should a wagon stop, the sucking sands would likely engulf it. Not only was the crossing a success but A. C. profitably sold to some needy travelers several head of steers he had bought from Uncle Billy Winton. The mountainous trails were conquered. As they descended the elevations to Boiling Springs, a celebration was planned for July the fourth. Then calamity struck. Cholera broke out. A. C. was stricken. A way-faring Missouri doctor named Holloway supplied a mustard plaster and predicted, "You'll live". A. C. did live but he credited his own strong constitution for the recovery. When they renewed their westward journey, they left behind fourteen of their company. Two more were to die, W. C. Campbell and a sister-in-law, Elizabeth Cates. (Note: Elizabeth was the wife of Dudley Smith, Mahala's brother.) And A. C. was to spend nearly the whole of six days and nights in the saddle. Upon nearing Sacramento, California, they sold eleven cows for $100.00 apiece. Two fresh cows sold for $255.00 each. Nephew J. W. Mitchell handled the sales. When they closed their books, there was $8,000.00 to divide between A. C. and W. C. Campbell's representative. A. C. had made $400.00 or $500.00 on the side. A. C. decided to come home by way of the sea from San Francisco to Nicaragua, overland to the gulf waters where he embarked for New Orleans. He arrived home June 1, 1853. In that year, he commenced a mule trade in the South which ran until 1861. Being in Louisiana and ready to return home, he found himself holding $32,000.00 in drafts from planters for the sale of slaves and mules. This paper was payable in New Orleans. But A. C. had identified himself with the Union. He could not cash his drafts therefore he lost all and arrived home financially broken. With the outbreak of the Civil War, A. C. steered clear of involvement until Sterling Price's threatening invasion of Missouri in 1864. He then was asked to report to Company F commanded by Capt. Lunsford of the old 25th Regiment of the Enrolled Missouri Militia. Upon arriving in Springfield, Missouri, he was commissioned Colonel by General C. B. Holland. Because various companies were below strength, the new Colonel was ordered to secure recruits. Visits to Buffalo, Humansville, Stockton, and Bolivar rectified this condition. When Colonel A. C. Mitchell arrived back in Springfield, he heard objections had been voiced against his commission. He offered to resign, but General Holland was adamant. The two compromised with A. C. acceding to a proposition that the soldiers select their commanding officer by ballot. A. C. was overwhelmingly elected Colonel by the regiment over his opponent. In 1865, he was discharged in Springfield. In 1870, he was elected as a delegate to the General Conference of the Methodist Episcopal Church, South. There he was placed on a committee to look into the condition of the colored people. His role in the committee's work made him chiefly responsible for their being set apart as a separate organization in the Methodist connection and deeding them any property held in trust for them by their white brethren in Nashville or any other place. They were authorized to elect their own bishops and other officers as soon as their financial, numerical, and spiritual conditions justified such action. This was a wise provision at that time of history but it has all been changed in present day Methodism. Blacks today enjoy all the rights and privileges of members in the contemporary church. On August 27, 1876, Adam's wife Mahala, died at their Polk County home and she was buried in Mitchell Campground Cemetery. Their eight children were all boys. The colonel ultimately was to have fifteen grandchildren. All but one were boys. After Mahala's death, the Colonel or "Uncle Dock" as he was affectionately called, moved to Shreveport, Louisiana, in 1877. There he purchased a livery barn where he bought and sold mules and horses. Perhaps the crowning glory of his career was found in his Methodist Church life. The Louisiana Annual Conference sent A. C. to the 1882 General Conference at Nashville. There he had the unusual experience of seeing a fellow delegate, Dr. T. O. Summers, standing only a few feet from him, fall dead while addressing the conference. In 1886, A. C. was elected to the General Conference which convened in Richmond, Virginia. Another distinction of which A. C. was proud was that of being Grand Commander of the Grand Lodge of the Independent Order of Good Templars in the State of Louisiana. That order had selected him to be a delegate to the Grand Lodge of the World of that Order. He was excused from the floor of the General Conference to attend the Grand Lodge of the Order of Good Templars. There he was elected Grand Marshal of the Lodge of the World. Delegates from five continents were present. Colonel Mitchell's cup must have been filled to overflowing. He had been highly honored by his church and his lodge. Mary E. Mitchell, the Colonel's second wife, died on November 17, 1897, in Shreveport. In 1901, Colonel A. C. Mitchell moved to Borden Co., Texas, to join his sons, Captain James D. Mitchell and John Knox Mitchell , both of whom were developing herds of purebred Herefords and Durham cattle. Colonel, W. A. Ruyle, a dear friend, has commented, "I've heard my father say that Dock Mitchell was a man of the best ability of any Mitchell he ever saw." Much of his ability must have been passed on to his son, Captain James D. Mitchell, who died suddenly of a heart attack in 1902. The paper said of the ex-Missourian "he was genial and possessed of gentlemanly manners, a model man, and a perfect boss." The epitome of Mitchell manhood is dramatically displayed in the saga of Adam Clark Mitchell." This family story was written by a daughter of Herman von Roeder, Agnes Sorrells. It is a large file and for that reason I have separated into two separate files. Copyright © 7/9/09 to present by Norman Newton. This information may be used by individuals for their own personal use, libraries and genealogical societies. Commercial use of this information is strictly prohibited without prior written permission from Norman Newton. If material is copied, this copyright notice must appear with the information and please email me and let me know. Neither the Site Coordinators nor the volunteers assume any responsibility for the information or material given by the contributors or for errors of fact or judgment in material that is published at this website.